Conversation with friends in the old “Chin Wag” before Augsburg Choir rehearsals. What makes singing in a choir so great/powerful/exciting? The act of making something beautiful together – a true act of community. The joy of performing a piece – the final result of hours and hours of rehearsal. Then, of course, all the non-musical things wrapped up in it all – singing with friends, the performance spaces, the stories about the history of a piece – all coming together. What excites you about working with Masterworks? The caliber of the singing is so very high and the possibilities are endless. What are you looking forward to with Masterworks? Over the past four years, it’s been great fun for me to have worked first with Cedar Singers and then the Augsburg Choir. Osmo Vänskä, the conductor of the Minnesota Orchestra, says it’s all about the music – and it is. 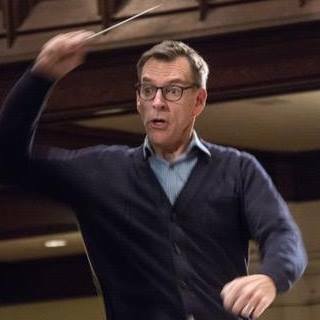 How we form a phrase together, how we mold sound – not necessarily a pre-conceived notion of what an ensemble should sound like – but rather what we do with the sound we have. That’s the concept I used with both Cedars and Augsburg Choir – it works – and the outcome can be really thrilling. It’s hard to put into words what the 50-plus singers in the Choir came to mean to me. Again, it’s all about community. It was a joy to be able to make music together – and I think it showed in each and every performance. We had great fun – and it showed in their singing. I am extraordinarily proud of those wonderful musicians (some whom I knew since they were first-years in Cedar Singers). Their musicianship and growth over the years. To work with them was both an honor and sheer joy. If I wasn’t able to do what I am doing (choral music, organ, composition), I’d LOVE to have a talk-show. If you are interested in joining The Masterworks Chorale, the gatherings are open to anyone interested in singing! The first gathering is Tuesday, September 4th from 7:00 pm – 9:00 pm in the Choir Room (M2) in Augsburg University’s Anderson Music Hall. 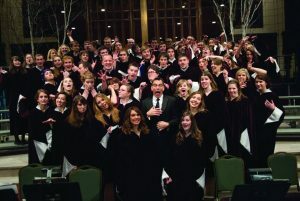 For more information visit the Augsburg University Masterworks Chorale Facebook page here. For the Augsburg University Music Department website, click here.